This gamma ray blast is very interesting and having a very powerful affect for us here on Earth. It is further blossoming and unfolding our ascension to the New Earth reality. What a beautiful dance of creation and when in silence one who goes traveling within can tap in and view the marvels of miracles that are there to behold. If your bodies are experiencing physical challenges such as headaches, muscles aches, stomach aches or muscle cramping or jolting of the entire body you can bet you are aligning to what is transpiring within the cosmos as an empath of our universes evolution. Times of change and morphing are upon us. What I have received about this supernova that Nasa speaks about is associated with the blue ray coming to us from universe 2 on October 17th, 2006. It was called Mission 1017 where our thoughts and intentions were magnified a thousand times between the coordinates of 10:17AM and 1am 10-18-2006. I was at the Serpent mound in Ohio (amazing cosmic portal) on 10-18-06 where I was gifted with an amazing picture of the head of the serpant where I had set up an altar for ceremony and meditation. It was golden/orange energy emanating from the head of the serpent, which I was connecting to it was the golden magi, very high vibational beings assisting from on high. This nova is just coming into our awareness to perceive from 12.2 billion light years away. It's energy and purpose are of great magnitude and offer pure potential beyond what we have been aligned with in this hour of need. It is creating a quantum leap so to speak when the divine timing and perfect alignment of the cosmic codes (tetranomes) of its centropic energy drenches this planet and all of it's inhabitants. The exact time is not given but it will be sooner than 2012. I am not sure if this knowledge is meant for me specifically and anyone else who is aligned with it's potential or if this will catapult the masses and grace us all with the New Earth reality of pristine air, water and earth when it's quantum abilities are sparked into the earth;s grid and we are energtically prepared for it. I believe this is what will bring forth the zero point alignment of the Earth plane. The Earth has went from vibrating at 6.8 hertz some 8 or so years ago to 12 and some odd hertz today and when we reach 13 hertz this is the HUman resonance which will bring us back and align us to the divine blue print of perfection, limitless physical perfection The photon energy is greatly assisting us from the Great Central Sun but this is yet another part of the divine plan sequence of our evolution. The One Divine Mind of the Creator is blessing us with this amazing cosmic rain through the law of cause and affect bringing and answering all of our prayers and visions back to us creating a sustainable planet where all life is treasured and respected. This I see with an inner eye and it is so close it is bleeding through our reality, blinking in and out that it will be soon. So tune in to this loving gift that we here on Earth have gifted ourselves through the creators laws if you so desire and if this resonates as truth for you. Take in and drink from this what you will. Also we entered the Red Serpent Wavespell of the Mayan Dreamspell calendar with the Galactic Hawk Moon on February 17th.. These wavespells consist of 13 days and this one has 10 out of the 13 that are galactic activation portals that ask us to enter them and drink of what they energetically offer starting on Feb 18th through Feb 27th. It is unusual to have this many galactic portals one after another for this many days. I can give a brief energtic impression here for you. There is much information on line if you are interested in aquiring more information on line about how to use the Dreamspell Mayan calendar. This is just one of 22 Mayan calendars. They all have their puropse ushering up to the collapse of time as we know it. We can align with this energy here and now by using the Mayan calendars. It places us in the true reason for being a HUman and that is that a physical experience equals art/creation unlike the consciousness of time equals money. We are moving out of being in that experience and our reality of it is being broken down for the highest good of all. We will be just fine and be so busy creating all the changes and new ways of being that there will be so much "work" we will not be able to fill the job assignments. This too I see on the inner. We are in the midst of the Sixth Day of yet another Mayan phropisized phase which is the energy of flowering and renaissance, How beautiful is that!!! and we have also entered into a galactic cycle of our evolution (can't remember how many years this will be) as per the Amncient Mayan eldlers who have been so right on about everything that they have shared throughout eons of time. The artilcle and picture of the gamma ray burst along with the days the comet is closet to Earth is at the end of this email. I did want to share with you a brief energetic impression of the galactic portal days past and to come as per the Dreamspell calendar. Skip to the aricle for your convenience and just read the energies of the day each day they arrive if it so resonates in your heart. The days I have listed below are only the 10 galactic activation portal days. The wavespell actually started on 2/17 and goes through the full thirteen days ending on 2/28. 2/19 - Blue Electric Hand: Activate to know, bonding healing, seal the store of accomplishment, guided by the power of purpose... enter me. 2/20 - Yellow Self-Existing Star: define to beautify measuring art, seal the store of elegance with the self-existing tone of form, guided by the power of flowering...enter me. 2/21- Red Overtone Moon: empower to purify commanding flow, seal the process of universal water with the overtone of radiance, guided by the power of navigation... enter me. 2/22- White Rythmic Dog: organize to love balancing loyality, seal the process of heart with the rythmic tone of quality, guided by own power doubled... enter me. 2 /23 - Blue Resonant Moneky: channel to play inspiring illusion, seal the process of magic with the resonant tone of atuunement, guided by the power of abundance... enter me. THE NEW MOON OF 2/24 - Yellow Galactic HUman: harmonize to influence, modeling wisdom, seal the process of free will with the galactic tone of integrity, guided by the power of intelligence... enter me. 2/25 - Red Solar Skywalker: pulse to explore realizing wakefullness, seal the output of space with the solar tone of intention, guided by the power of universal water... enter me. 2/26 - White Planetary Wizard: perfect to enchant producing receptivity, seal the output of timelessness with the planetary tone of manifestation, guided by the power of spirit... enter me. 2/27 - Blue Spectral Eagle: Dissovle in order to create releasing mind, seal the output of vision with the spectral tone of libertion, guided by my own power doubled. NOTE: Interesting how the vibrations of the primary colors and then all of them together, the white are used in sequence. For this wavespell the white is used first then blue, then yellow then red and then it starts the sequence over. I just noticed this and I have been following this calendar as much as I can for a few years now. I have acquired a program that is wonderful thanks to a most wonderful friend and fellow lightworker. AFP/NASA This NASA image shows an X-ray afterglow in orange and yellow in this view that merges images from Swift's ? WASHINGTON (AFP) The US space agency's Fermi telescope has detected a massive explosion in space which scientists say is the biggest gamma-ray burst ever detected, a report published Thursday in Science Express said. "Visible light has an energy range of between two and three electron volts and these were in the millions to billions of electron volts," astrophysicist Frank Reddy of US space agency NASA told AFP. "If you think about it in terms of energy, X-rays are more energetic because they penetrate matter. These things don't stop for anything -- they just bore through and that's why we can see them from enormous distances," Reddy said. A team led by Jochen Greiner of Germany's Max Planck Institute for Extraterrestrial Physics determined that the huge gamma-ray burst occurred 12.2 billion light years away. 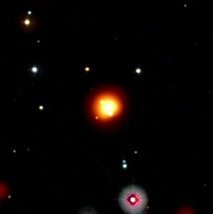 Taking into account the huge distance from earth of the burst, scientists worked out that the blast was stronger than 9,000 supernovae -- powerful explosions that occur at the end of a star's lifetime -- and that the gas jets emitting the initial gamma rays moved at nearly the speed of light. "This burst's tremendous power and speed make it the most extreme recorded to date," a statement issued by the US Department of Energy said. Gamma-ray bursts are the universe's most luminous explosions, which astronomers believe occur when massive stars run out of nuclear fuel and collapse. Long bursts, which last more than two seconds, occur in massive stars that are undergoing collapse, while short bursts lasting less than two seconds occur in smaller stars. In short gamma-ray bursts, stars simply explode and form supernovae, but in long bursts, the enormous bulk of the star leads its core to collapse and form a blackhole, into which the rest of the star falls. As the star's core collapses into the black hole, jets of material blast outward, boring through the collapsing star and continuing into space where they interact with gas previously shed by the star, generating bright afterglows that fade with time. "It's thought that something involved in spinning up and collapsing into that blackhole in the center is what drives these jets. No one really has figured that out. The jets rip through the star and the supernova follows after the jets," Reddy said. Studying gamma-ray bursts allows scientists to "sample an individual star at a distance where we can't even see galaxies clearly," Reddy said. Observing the massive explosions could also lift the veil on more of space's enigmas, including those raised by the burst spotted by Fermi, such as a "curious time delay" between its highest and lowest energy emissions. Such a time lag has been seen in only one earlier burst, and "may mean that the highest-energy emissions are coming from different parts of the jet or created through a different mechanism," said Stanford University physicist Peter Michelson, the chief investigator on Fermi's large area telescope. "Burst emissions at these energies are still poorly understood, and Fermi is giving us the tools to understand them. In a few years, we'll have a fairly good sample of bursts and may have some answers," Michelson said. The Fermi telescope and NASA's Swift satellite detect "in the order of 1,000 gamma-ray bursts a year, or a burst every 100,000 years in a given galaxy," said Reddy. Astrophysicists estimate there are hundreds of billions of galaxies. The Fermi gamma-ray space telescope was developed by NASA in collaboration with the US Department of Energy and partners including academic institutions in France, Germany, Italy, Japan, Sweden and the United States. Lulin will be closest to Earth -- about 38 million miles, or 160 times farther than the moon -- on Feb. 24 [ sky map].